Geographical Indication (GI) is an official description of an Australian wine zone, region or sub-region. The GI system is designed to protect the use of the regional name under international law and is governed by the Geographical Indications Committee, overseen by Wine Australia. The Barossa (zone) is located north of the city of Adelaide in South Australia. It comprises two distinct and complementary regions, Barossa Valley and Eden Valley, which were formalised in 1997. High Eden is the only officially declared sub-region. The GI is purely geographic in concept, similar to the European Designation of Origin system. An area that usually comprises one or more regions. 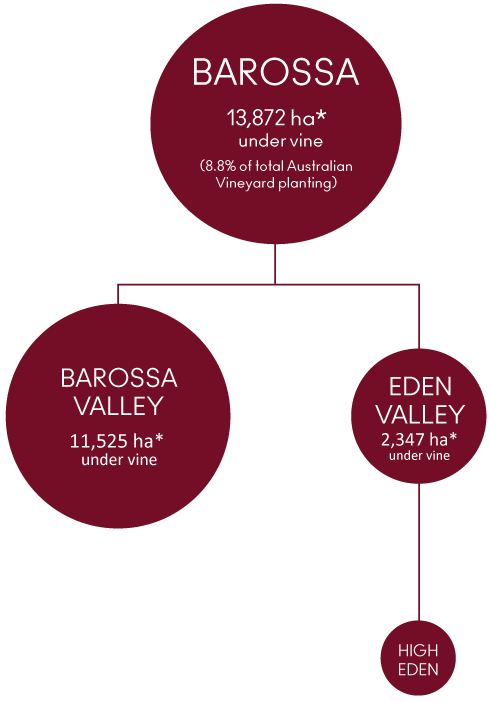 In 2017 the Barossa Zone has 13,872 hectares under vine. An area of land with unique and homogenous grape-growing attributes that produces at least 500 tonnes of wine grapes in a year, comprises at least 5 independently owned vineyards of at least 5 hectares each. In 2017 the Barossa Valley Region had 11,525 hectares under vine. In 2017 the Eden Valley Region had 2,347 hectares under vine. A sub-Region must fulfil the same criteria as a region but grape-growing attributes must be more unique and homogenous. Read more about Barossa GI – visit Wine Australia website.